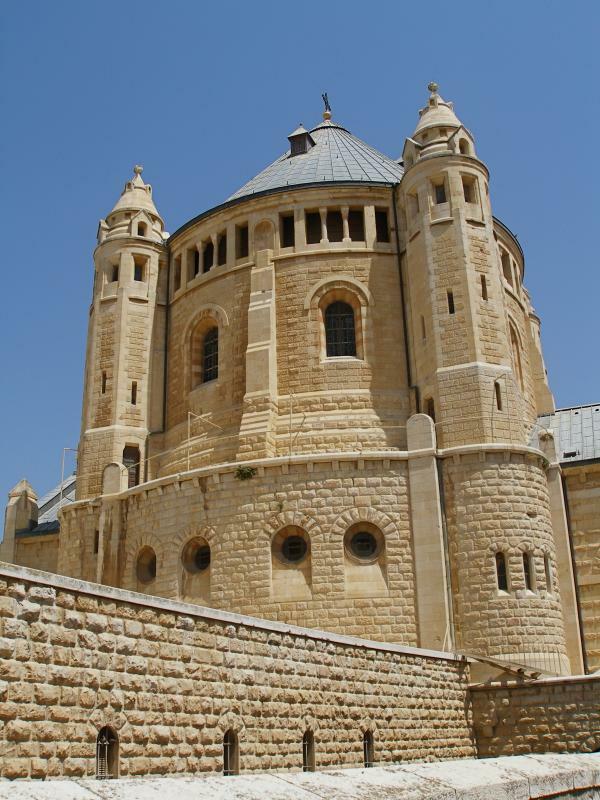 The hill of Mount Zion, the highest point in ancient Jerusalem, is dominated by the Church of the Dormition. The location is identified in Christian tradition as the place where the Virgin Mary died — or “fell asleep”, as the name suggests. The fortress-like building, with a conical roof and four corner towers, stands south of the Old City’s Zion Gate. Nearby soars the bell tower of the Hagia Maria Sion Abbey (formerly the Abbey of the Dormition), a Benedictine monastery. During the Byzantine period, the Church of Hagia Sion (Holy Zion), one of the three earliest churches in Jerusalem, stood on this site. Built by the Emperor Constantine, it was regarded as the Mother of all Churches. In AD 614 it was destroyed by the Persians. Two cities, Jerusalem and Ephesus (in present-day Turkey), claim to be the place where the Virgin Mary died. The Ephesus claim rests in part on the Gospel account that Christ on his cross entrusted the care of Mary to St John (who later went to Ephesus). 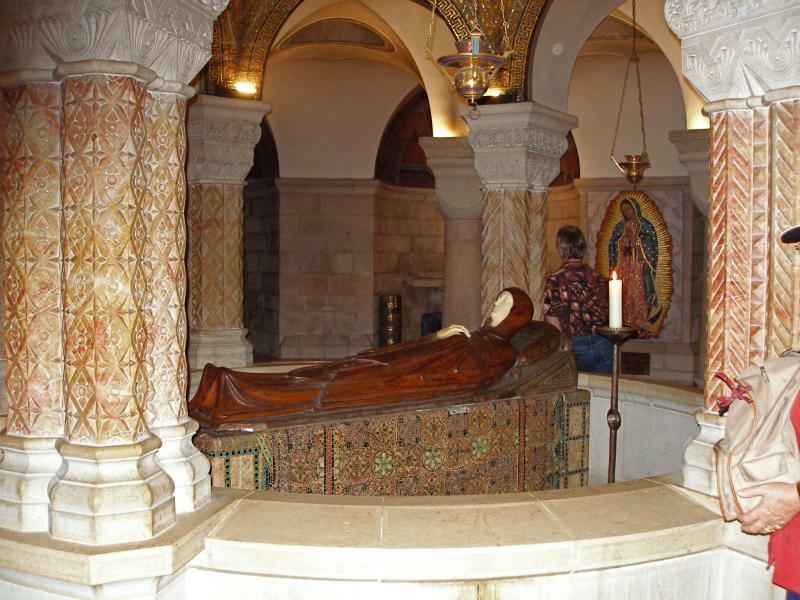 But the earliest traditions all locate the end of Mary’s life in Jerusalem, where the Tomb of Mary is venerated at the foot of the Mount of Olives. Accounts of Mary’s death in Jerusalem appear in early sources such as De Orbitu S. Dominae, Transitus Mariae and Liber Requiei Mariae. These books are described as apocryphal (meaning “hidden” or “secret”). Their authenticity is uncertain and they are not accepted as part of the Christian canon of Scripture. The belief that the Virgin Mary was bodily assumed into heaven is mentioned in the above books and also in authenticated sermons by Eastern saints such as St Andrew of Crete and St John of Damascus. 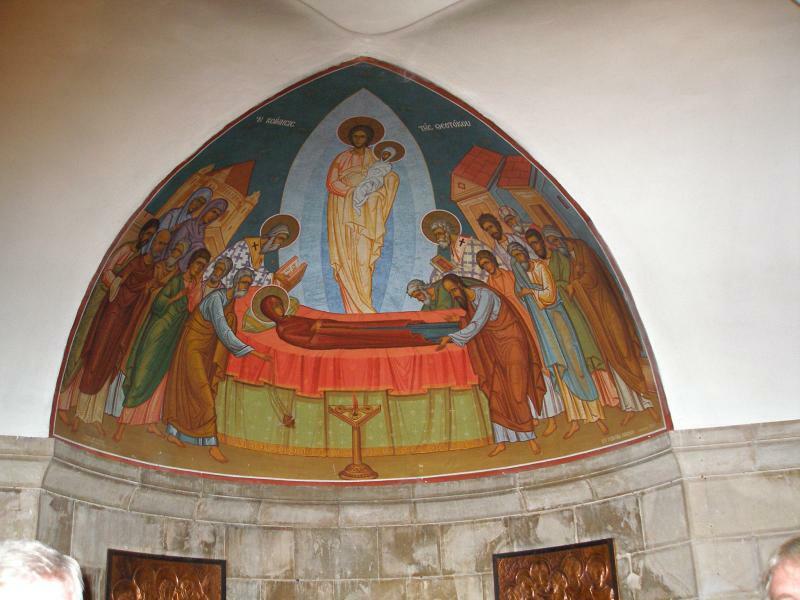 The Eastern Orthodox churches celebrate the feast of the Dormition of the Mother of God on August 15, the same day that the Catholic Church and some Protestant churches celebrate the feast of the Assumption of Mary. The land on which the Church of the Dormition stands was given in 1898 by the Turkish Sultan Abdul Hamid II to Kaiser Wilhelm II of Germany, who presented it to the Catholic Church. Construction was completed in 1910. Like the Crusader church that preceded it, the basilica is built on two levels with the high altar and monastic choir on the upper of these, and the crypt with its Marian shrine on the lower. Light from several large windows pours into the upper level, and colourful wall mosaics depict events from Christian and Benedictine history. If the upper floor of the Church of the Dormition is luminous, the circular crypt seems totally shrouded when first entered. In the centre, under a rotunda, is a simple bier on which rests a life-size statue of Mary, fallen asleep in death. The statue is made of cherry wood and ivory. The dome above the statue is adorned with mosaic pictures of six women of the Old Testament: Eve, Miriam, Jael, Judith, Ruth and Esther. In the 1948 Arab-Israeli War, the church was seriously damaged by military bombardment. 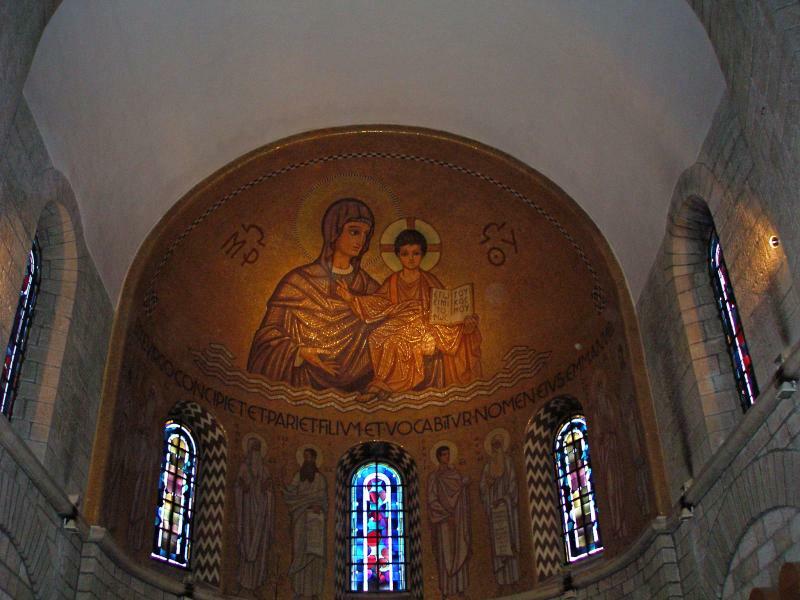 During the 1967 Six Day War, Israeli forces took possession of the building and the Mother and Child mosaic in the apse received a barrage of machine-gun bullets from the interior of the church. The Dormition Church has a fine organ, which is often used for concerts. Maas, Anthony: “The Blessed Virgin Mary”, The Catholic Encyclopedia (Robert Appleton Company, 1912).